Another Day, Another 18 Wheeler Roll Over Accident at FM-2665 and US-59, GOODRICH, June 26, 2008 - In what seems like Dejavu, another 18 wheeler roll over accident occurred in what seems like a repeat of almost exactly 24 hours earlier. At approximately 4:55 pm on June 26, 2008, a white 1999 Volvo 18 wheeler driven by Salum Jaffer, 44, of Georgia was south-bound on US-59 in the Goodrich area when his truck began to slide. According to Jaffer, he was traveling about 60 mph when the sliding started. The truck initially began sliding to the left, and when Jaffer tried to correct the sliding, the truck began sliding to the right and went off the highway, down an embankment, and into a ditch where the truck it rolled over. 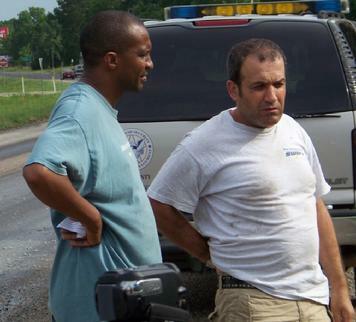 Jaffer and a student driver, David Kalil, who was with him were trapped in the tractor/trailer but managed to get out. Both men were checked out by a crew from Americare Ambulance Service and were determined to be physically okay. DPS Trooper Brent Henry was dispatched to the scene of the accident. In addition to Trooper Henry, other notables at the scene were Polk County Emergency Management Coordinator, Ken Hambrick, Livingston Fire Chief, Corky Cochran, Allen Cook, Polk County Commissioner Pct. 4 Tommy Overstreet, several Sheriff's Deputies and volunteer firemen from Goodrich and Livingston. Jaffer's trailer was fully loaded with pottery and headed for Laredo, Texas when the roll-over accident occurred. Onlookers gather to watch the recovery process. One concern at the scene was the environmental damage caused by the truck leaking diesel. 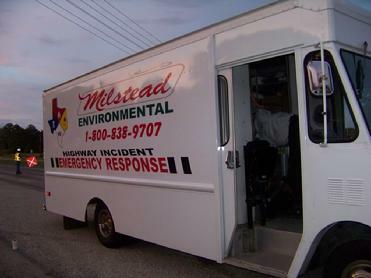 Milstead environmental brought in a team to deal with the leaking diesel that was leaking into a ditch that was flowing with water from rains earlier in the day. Two heavy duty wreckers were brought in from Milstead Automotive out of the Woodlands to recover the tractor/trailer. The drivers from Milstead were concerned during the recovery about the weight of the load tearing through the side of the trailer, spilling it's contents everywhere during the recovery process, and were considering unloading the trailer first, they opted to push the envelope and it paid off. The recovery was successful and the trailer held up. One lane of traffic on 59 south was blocked during the recovery process. The driver complained that the road was dangerous and slippery and that he did nothing out of the ordinary to cause the truck to slide. Milstead had all the right equipment and know how to recover the truck and did so meticulously and cautiously as they put on a text-book demonstration on how to properly recover a turned over 18 wheeler. Jaffer was issued a citation for unsafe speed. The accident was cleared out by around 9 pm. There were parallels between this accident and the one 24 hours earlier. Both happened within minutes of the same time, both were 18 wheelers, both drivers walked away un-hurt, both happened at FM-2665 and US-59, both accidents were worked by DPS Trooper Brent Henry, both were cleaned up by around 9 pm. An environmental crew was brought in to clean up diesel that was leaking into a ditch flowing with rainwater.